As I begin to write this entry I find it more than a little curious that I now live in a town with a pilgrim’s church and refuge, albeit not in Spain and not on the route we walked all those years ago. There are many roads that lead to Santiago, and we are on just one of them. But what the heck is Santiago, you might be asking? I know I was before May of 2001! Santiago de Compostela is the supposed resting place of St. James, one of the apostles of Jesus. If memory serves me, he arrived in Spain already dead, in a boat steered by the Holy Spirit. At some point, hundreds of years later, he sort of appeared again to help kill a whole slew of Moors in Spain, thereby saving the country for Christianity. After some time Santiago de Compostella (where his remains were meant to have been found) became the 2nd largest pilgrimage route in Christendom behind Rome. Santiago (St. James) apparently came back at least one more time to walk to his own burial place, making him his own first pilgrim…take some time to wrap your head around that one! You can imagine the confusing iconography this leads to. Basically, if you see a bearded guy dressed like a pilgrim, or on a horse slaying Arabs, that is Santiago. The truth is there are a great many bearded guys carved into the churches along the way, so the extra equipment is very useful for identification. I’m not Catholic but I like to walk. And I like cheap vacations even better. The Camino de Santiago is cheap and it is also at least 700 km long (much longer if you start from, for example, Munich or Canterbury), so in theory a very good idea for a trip. But let me go back a bit. Shoko and I had quit our jobs once again (less than a year after our last time, but there’s not enough space to give that story here) and arrived in Paris to catch our TGV down to Saint-Jean-Pied-de-Port on the French side of the Pyrenees, and the most popular starting point on The Way. 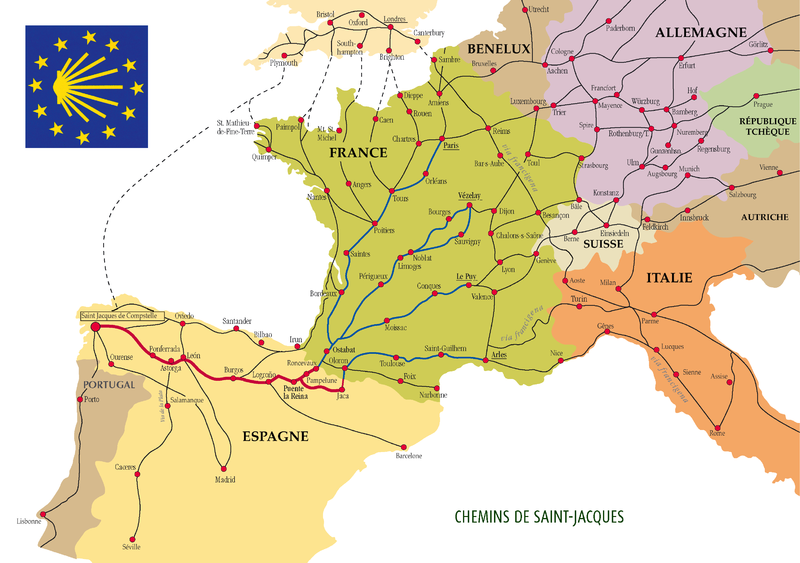 Tip: If you are starting the Camino in France, visit the SNCF site for train schedules from inside France. If you are coming from another country in Europe then try the DB Bahn site, which, with German efficiency, gives you schedules to any point in Europe from anywhere else. When you start out on The Way, you get a credential, which is a passport in which you collect stamps at each refugio you stay at. Each refugio checks your passport to make sure you are indeed walking (or cycling or riding a horse…) and collecting the requisite stamps, thereby allowing you to some truly cheap (or even free) and often extremely atmospheric digs for the night. This is a page of my credential. This little piece of paper gives you a sense of importance, since it is your ticket to discounted meals and even – at least in our case – free medical care! You also begin to feel that you are a part of a community, an endless stream of walkers/pilgrims/ that have been following this same route for a thousand years. It’s quite a feeling, if you let yourself think about it. And speaking of community, the Camino is a wonderful way to make friends. you inevitably see the same faces day after day, or perhaps lose them for a week or two only to meet them again on the streets of Santiago. The Camino really enhances your chances of connecting with a wide range of people from all over the world. Alright, back to the story. After a snowy crossing of the Pyrenees on our first day, and a stop in Pamplona on our second, we reached the long village of Puente la Riena, a meeting point of two different routes, so a pretty bustling little place, at least in terms of pilgrim traffic. This is the puente from the other side of town. Next, a few shots from the trail. Walking across the entire length of Spain takes time – in our case 5 weeks. I often say that cycling is the ONLY way to really see a country, but if you have a medium-sized place, with a ton of time (oh, and evenly spaced cheap accommodation…), it’s hard to beat walking. It’s nearly impossible to shut out your surroundings since the going is so (often agonizingly) slow. At least on a bike you can whiz by villages in minutes, but when you are walking you are really forced to BE where you are, if you get me? One thing I’ll never forget about northern Spain is the storks. Nearly every church had a giant nest topping them. The Camino is a spiritual experience, but it is (and always has been, I’m sure) a way for some folks to make a few bucks. If you left home without your pilgrim’s hat and water gourd, fret not. The Way has what you need. The Camino is also big news for the locals. We were interviewed by a small newspaper one day at the end of our walk. Through a translator the interviewer learned that I was a Canadian student and Shoko was an English teacher from Japan…not even opposite, just nearly totally all wrong! How do we know this? Two or three days after the interview, while having a cafe con leche (worth the trip to Spain alone! ), the owner of the cafe came at us waving the paper in our faces with a big smile on his face. You don’t get many Japanese women walking across the top of Spain, so I suppose we were easy to spot. Here’s the picture from the article. There were many ups and downs during these five weeks (a stream of injuries/ailments for Shoko that culminated in a week’s rest in Leon, and two trips to a doctor, for example), but I figure if I start on one it’d only be fair to go through them all. Better just to say it was a wonderfully unique experience. 1. Get a guidebook. You probably won’t get lost too much, even if you have no map, but you will pass by a bewildering amount of history. A good guidebook will help. Buy ‘high tech’ gear, such as breathable, lightweight clothing. Forget cotton for walking, as it soaks up sweat and takes time to dry out. Hiking pants that convert into shorts. You know the ones I mean…with the zipper around thigh level that allow you to take the ‘legs’ off. 2-in-1 shampoo and conditioner. This was my wife’s recommendation. 3. Protect yourself from the sun. Sunscreen is a no-brainer, but make sure you have a way to protect your face and neck as well. There are stretches of many days without a tree in sight, not to mention that The Way is east-west, so in the afternoon you’ll be walking straight into the sun. 4. Earplugs! Unless you can sleep through an aerial bombardment, bring these priceless gadgets along. You are nearly always sleeping in a room with overweight men of a certain age, tired from walking and drinking cheap Spanish wine. A deadly combination! 5. Sensible Footwear. Again, probably not a revelation for hardened hikers, but for those who have no experience, here are a few ideas. Avoid heavy leather boots. Just overkill for the kind of walking you’ll be doing. Get something with ankle support, unless you are going very light. Get proper hiking boots. Too many attempt the Camino with running shoes – a possibility if you are not carrying 5 to 10 kg of gear. You need boots with a solid and stiff sole. 6. Brush up on your Spanish…and French. We found more French on the trail than any other nationality, except Spanish. For those of you who seriously might want to improve either language it is an excellent chance. You have endless hours walking, talking and eating with others (if you choose to). For those with no interest at all, it is still pretty necessary to learn at least the basics. Here is a short video from the UNESCO site that gives a broad introduction to the pilgrimage. And a trailer to a documentary that is now (late 2010) in post-production. This entry was posted in Europe (ex. France), Longer Trips/Flashbacks, Spain, Walking and tagged camino de santiago, pamplona, pelegrino, pilgrim, pilgrimage, puente la reina, santiago de compostela, st. james way. Bookmark the permalink. I enjoyed reading this post, as I am planning on walking my first Camino in September. Thanks, and good luck with the walk. I think you’ve picked a good time to go. 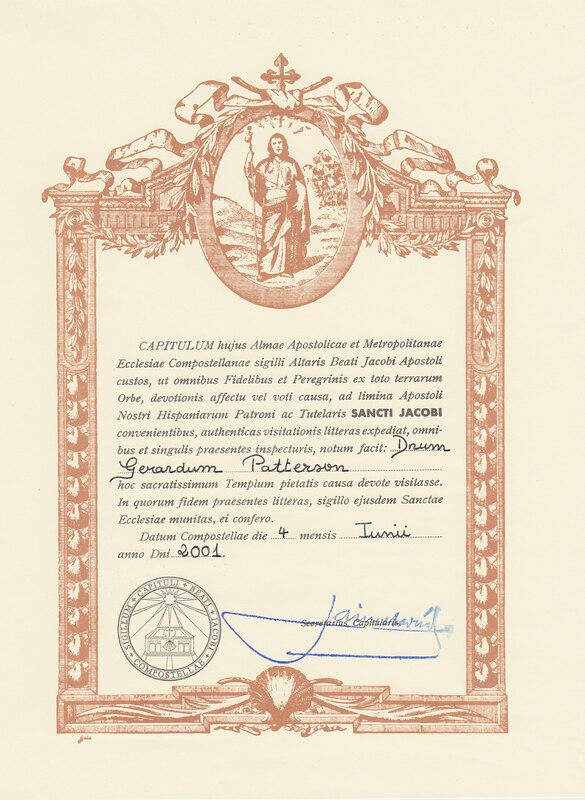 Jacobin House means house for pelegrins to Jacob from Compostela. Sant Jacme de Compostela in occitan language. Jacme = Jack or James in english. James came in england after the Hastings battle, 1066, for the gascon (occitan from Gasconha/Gascony) Jacme. Jacme Ier have conquered territories ont muslim future spain (Països Catalans are spain for 1704 only). I enjoyed reading your article… loved it as a matter of fact! I, too did the Camino de Santiago back in 2001… And it was rather odd because people would be inviting me in for a cafe con leche, or inviting me one at a bar…. “Oh a Mexican pilgrim”…. I too eventually moved to Spain when I met my future husband doing the Camino back in 2006. Hope you are well, happy and enjoying life…… The Camino does indeed begin when we leave Santiago doesn’t it??? And it is truly wonderful……. I see that I never responded to your comment. Well, 2 years late is better than never! I didn’t meet any Mexicans when I was there, so I’ll bet you were a rarity, for sure. Are you still in Spain? We are in southern France and one of the ‘ways’ goes just south of us, although I doubt it’s used much these days. Enjoyed your info – but it was much too short for me. Beautiful pics! Good practical tips. I would add: flashlight, sleeping pills, small alarm clock, baby wipes….I love the map of Spain and the pic of credentials, but there is no beginning and no end of your story…and what was the main point/reason for you to do the camino (cheap walking vacation – that’s all?). I plan to do the CAMINO in June wish me luck ! Thanks for your comments and editorial critique on the article. I’ll try to find better beginnings and ends to my stories from now on. And yes, guilty as charged, the reason for doing the Camino was indeed related to walking and cheapness. I knew virtually nothing about it before I did it, to be honest. One recommendation from a Spaniard I met in Nepal and that was it. Sorry to disappoint you on my purposes. I hope you have something better! I’m writing a story and I want to set it on the Camino de Santiago. Dirt road, farm fields to one or both sides, a small town/village many kilometers up ahead. It’s hot, desert-like. Farmers working in the field. A bird’s eye view shows him alone, walking this road. That’s as much as I can see right now. I need a place to put him and the name of a town up ahead. Thanks! enjoy alot about your writing. I plan to do the Camino in May 2011. But I only have two weeks vacation, could anyone suggest me where to start . I would say Ponferrada is as far as you want to start. It’s around 210 km, so that would be 20 km a day or more – certainly possible. It’s well worth the effort, trust me! I enjoyed your account of the Camino. We’ll be cycling from Burgos this summer, and are really looking forward to it. Thanks for the comment, Nancy, and Bonne Route this summer! I loved reading about your trip. Thank you very much for sharing! I am going in late April. We start in St Jean Pied de Port. I wont lie, I am a bit terrified of the first days. How was crossing the Pyrenees? I have trained for about a month, walking on average 10 miles a day, 3 times a week. I would appreciate any information/advice on crossing the Mountains. To be honest the climb up and over the mountains weren’t that tough, except for the snow storm we had! I’d say the training you are doing is more than sufficient – most of the people we met on the Camino had no walking experience at all, and they suffered for it. You will do fine. There are virtually no big climbs along the route except the beginning and the end…at least that’s how I remember it. However, there’s something to be said for the rigors of walking on the flat, for sure. I found it hard because I have flat feet, perhaps. I would say don’t go too heavy with your footwear, but definitely not running shoes either (like many had). So, back to your original question, there’s no reason to be afraid of the mountains, really. The path is simple to follow and if you have some hiking experience (as opposed to just walking) then it shouldn’t be hard. One last note: we left in late April as well and were shocked (mainly because of bad researching skills) how cold it could be in northern Spain. Come prepared for cold and rain. It wasn’t the best weather the first week for us. Of course anything can happen with the weather, so you might have glorious sun every day you are out there.